The latest assembly session that would begin on January 30 is going to be the last session for this TDP Government. With elections fast approaching, one can very well imagine the contours of the next budget. The budget will sure contain all those elements that YS Jagan has been promising to the people all these years. One will not be surprised if Chandrababu makes announcements of huge allocations to various projects, schemes and for corporations. 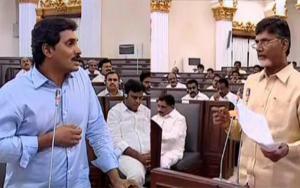 Also expected is an unending tirade on the Opposition YSRCP for boycotting the assembly once again. There would be lot of mud-slinging on the Opposition. But, despite all the muck-raking, the people of the state fully know the reasons for the boycott and this is manifest in the massive support that Jagan is getting for his Praja Sankapa Yatra. The Asssembly should normally debate the acts of omission and commission on the part of the government. But, what we see is rowdyism and goondaism ruling the roost in the assembly. The speaker is doing precious little to rein in a hooligan ruling party. The government is muzzling the voice of the Opposition. This has been the wont of the Telugu Desam. In fact, even TDP founder NTR is no exception to this. Even the founder was dethroned and disallowed from speaking onthe floor of the assembly. Both the ruling party and the Opposition party should work to achieve a balance in the party. But, the TDP is chosing to encourage defections from the Opposition. It had managed to lure away 23 Opposition MLAs and made some of them minsters too. This is downright immoral. The speaker is adopting every dilatory tactic possible to defer disqualification of the defectors. Neither Chandrababu nor the speaker have ever asked the defectors, who won on the YSRCP symbol, to resign and seek re-election. In fact, both the CM and the speaker or any responsive government should explain as to why they encouraged defections with the bait of ministerial position. In a democracy, both the Government as well as the Opposition are answerable to the people. But, the ruling TDP has abdicated its responsibility towards the people of the state. It is once again back to its oft-repeated strategy of misguiding the people through sops and lures. The people of the state very well understand this strategy of the ruling TDP.